The recent development of Oslo Airport is not only Norway’s largest onshore construction project, it’s also been EGGS’ largest service design project. 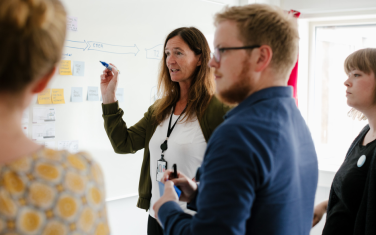 In cooperation with Norwegian civil aviation operator Avinor, EGGS has helped design a complete organisational change and capacity-building programme for 20,000 employees. 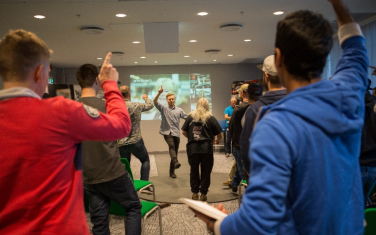 Via various physical and digital learning environments, all staff at Oslo Airport - including air and ground crew members - have been trained to adopt a new customer-centric mindset. This will ensure the airport operates with maximum efficiency once its new Terminal 2 extension has been officially opened in April 2017. Oslo Airport is now ready to cope with more passengers than ever - from 17 million people per year to 28 million. With an extended terminal building, the floor space will be expanded from 148,000 m2 to 265,000 m2. The airport will feature a new train station, check-in areas, technological solutions for baggage handling, security checkpoints, food and drink outlets, duty free and other shops, toilets and baby care rooms. 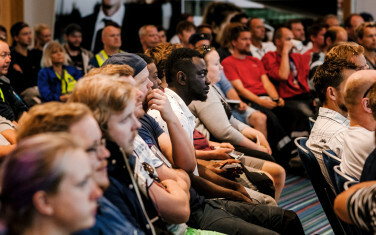 To deal with the massive passenger influx and take advantage of the improved infrastructure, Avinor wanted to make certain every employee throughout its 1300 subcontractors embraced a new customer-centric mindset. The goal is to maximise people's experience of Oslo Airport, making it more attractive for international transfers, and to entice people to visit Norway. To generate a cultural shift within any organisation takes a lot of strategic planning, but when the employee numbers are the size of a small Norwegian city, the task becomes a major challenge. From checking in to baggage handling, security, flight turnarounds, etc - every aspect of the airport is interconnected, and therefore relates to one common service, either closely or more peripherally. How do you get 20,000 people to share one common mindset? EGGS’ solution is to always focus on the people it affects. So, we began by collecting as much passenger insight as we could. Then in co-creation with employees, we produced a series of illustrative process models, photographs and graphic representations. This resulted in new employee knowledge and skills being taught to manage the new work situation and increased service ambition. Everyone was learning together to build a new common culture. 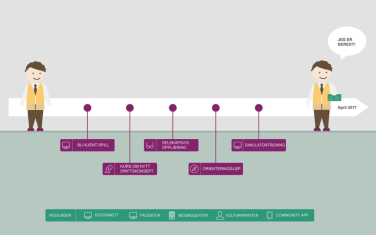 We mapped out a holistic learning journey - a thoroughly orchestrated training program made up of several courses, small and large scale events, a physical handbook, training packs and assorted digital tools. Starting in spring 2016 we ran three courses with variations based on the five main operations performed at Oslo Airport: departure, arrival, transfer, baggage handling and turnaround (landing, disembarking, cleaning up, refueling, food, passengers, luggage, takeoff). Whilst teaching, we simultaneously tested out new methods. During a series of live courses, a closely orchestrated experience was designed. Kicking off with a welcoming handshake from the course holders, it included symbolic scenography, facilitated interaction with co-workers, presentations and participation, and personal commitment exercises. EGGS designed the whole learning experience as a service for the employees, but always with the needs of the customer in mind. In total, 12,000 employees physically took part in the courses, while another 4,500 completed a digital on-line version, known as Crew light. It takes a dedicated team to implement complex change. Especially when you have such a diverse group of employees like Avinor. By designing a learning journey for them, we conceptualised multiple touch-points to ensure repetition, variety and motivation. Throughout all our designs, we took into account the fact that some users had worked at the airport for up to 25 years, whilst others were perhaps starting their first day at work. Some were fluent in Norwegian and some weren’t. We also considered age and levels of education, skills and learning preferences. Added to that, they all had a wide range of different jobs with different employers. Facilitating for this diversity took a lot of deliberation and included all mannor of professional participants applying their expertise. Multiple touch-points were made by simulation experts, the communication agency Geelmuyden Kiese AS, event organisers JC and on-stage professional actors from Kulturkompaniet. All these elements were incorporated into the overall learning journey. All insight and conceptual direction was designed by EGGS, in close collaboration with Oslo Airport's project visionary, Anne Beate Hovind, and her dedicated team. The entire redevelopment of Oslo Airport has been thoroughly planned from day one. Avinor continued to operate at full capacity while all the construction work was taking place, and during the entire time the employees were being retrained. Step by step, new parts of the airport have been officially put into action. Including the phasing in of the new processes and new customer-centric mindset. Despite the rerouting of passenger traffic and relocation of retail outlets, EGGS has helped Avinor guarantee that the transition has been as smooth as possible. Because of this, the entire project is already considered to be an enormous success, even before the official grand opening. A sky-high achievement for all involved! By designing a customer-centric strategy and applying it for use in all types of jobs, EGGS has helped upgrade Avinor’s service culture to a whole new level. The overall aim is to create Europe’s best passenger experience (film in Norwegian).